Are you an IT Company? We would love to work with you. Web Design Enterprise is a high-end web development company that offers all types of web base application to its customers. Below is an IT web development project created for one of our clients. If you are a IT company an need web development or online advertising please give us a call today! 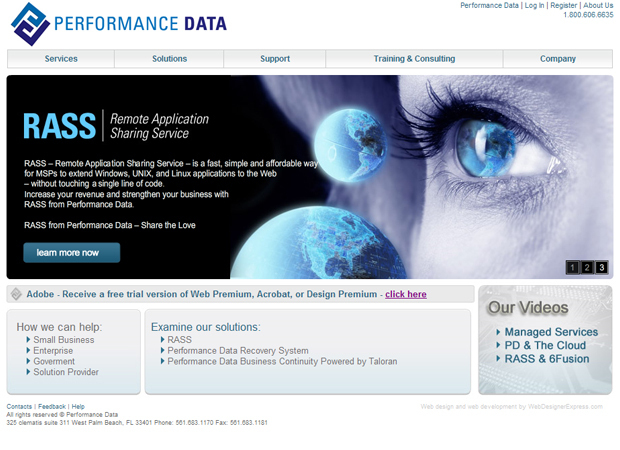 As a Professional Software and IT Development company Performance Data know their business. They are familiar with all types of web design and web development. They came to Web Design Enterprise because they know we are the best on what we do. The project you see above was created 100% custom made of the Performance Data Team. The website has a custom made flash animation on the home page and the website has over 50 pages on it. With every page having its one graphical banner on the top of every page this website is truly functional and high-end at the same time. It was a pleasure to work with the Performance Data Team. If you are and IT Company choose us for your web development and online advertising needs!